110cc of reliable, electric-start four-stroke fun feed into a gearbox, making the ATV-P001 a great choice for those getting started or moving up, and perfectly tuned to the rider starting to hone his or her ATV skills. This ATV designed to prevent overheating. 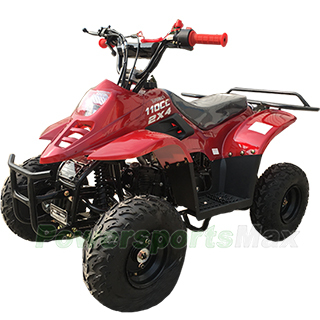 There will be no worries about overheating or extra engine maintenance with this ATV for you. 49.2" Length, 28.7" Width, 33.9" Height provide a roomy and comfortable riding for you. 145/70-6 steel tires offer excellent traction and help boost ground clearance. Double A-Arm arm suspension provides a better handling and more comfortable ride. Compact chassis design creates the ideal 33" wheelbase and low center of gravity for light, quick, super-accurate steering. 2.95 inches of ground clearance and a smooth undercarriage thwart most trail obstacles. Shipping charge for one single unit of ATV-P001 is $199.95(Please login to see real shipping charge for these states: Florida, New York, District of Columbia, Connecticut, Maine, Maryland, Massachusetts, Montana, New Hampshire, New Jersey, Pennsylvania, Rhode Island, Vermont, West Virginia, Delaware, etc.) , and you will get discounted shipping price if you order multiple item. Apollo DB-X5 125cc Dirt Bike with 4-Speed Manual Transmission, Kick Start, Hydraulic Disc Brakes, Big 14"/12" Tires! Awesome! My daughter loves it. The four wheeler is a little hard to start in the cold but great purchase. We just bought this 4-wheeler for our two kids for Christmas that are 7 and 5. This is a perfect wheeler for these age groups. After we got it I thought I should have paid the extra money to have it shipped already built. But now since I got it put together and everything works and is running great and the kids can't get enough of it. I am glad I didn't. It was kind of overwhelming at first. Seening all those parts and bolts that I have to put on knowing that I have to put it together right so I don't put my kids in danger. The service department answered all my questions that i had and got back to me very fast. I would recommend this wheeler to anybody. It was a great purchase for our family. It came in a crate and was in perfect shape no damage and very well shipped. Thank You Powersports Max. The whole purchasing process was very easy and fast ,hope I can receive my ATV soon. Kids love it, the right speed and very sturdy. Very happy with the quality for the price! When it comes to great prices, fast service and quality products, look no further than PowerSportsMax. ATV's, scooters, and so much more with the best price around, you just can't beat it. When my friend was looking for an ATV for their daughter for Christmas, the first place I mentioned to them was PowerSportsMax. They had exactly what they needed at a very very nice price. They ordered the 110cc Pink Camo ATV and it was delivered in less than a week.. Install was very easy and quick. PowerSportsMax went above and beyond to help out and get the atv in a rush.. They will be making a young girl a very happy girl when she wakes up Christmas morning. Thank you PowerSportsMax for being a great company and one that I can say is the best!! Keep up the good work. Fast! Thank you for your great follow up customer service. I was extremely pleased with the fit and finish and the overall quality of the ATV. when my kid received it, he was so excited. Great purchase experience, my kid love it! For the price and the ease of purchase and delivery, you cant beat this product. Great beginner ATVs.